As winter sets in and my desire for a hot breakfast grows, I find myself searching for the perfect bowl of hot oatmeal. I’m pretty picky when it comes to hot oatmeal. If you have been reading the blog for a while now, you may remember that I used to dislike homemade hot oatmeal. There was just something about it that made my stomach feel off after eating. But I don’t go down without a fight. I have been on a quest to make a hot oatmeal recipe that I would fall in love with and I think I have finally found my match. 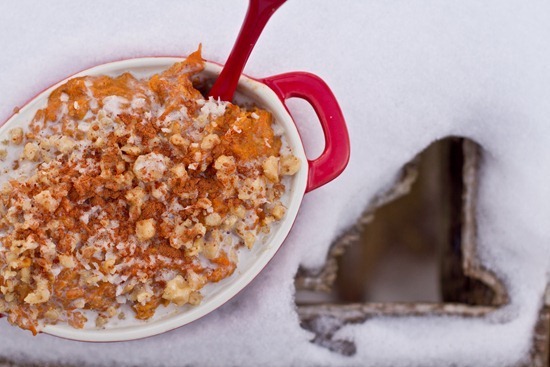 I attempted a couple carrot cake oatmeal recipes last winter, but they never turned out as good as I was hoping. This recipe finally got it right! 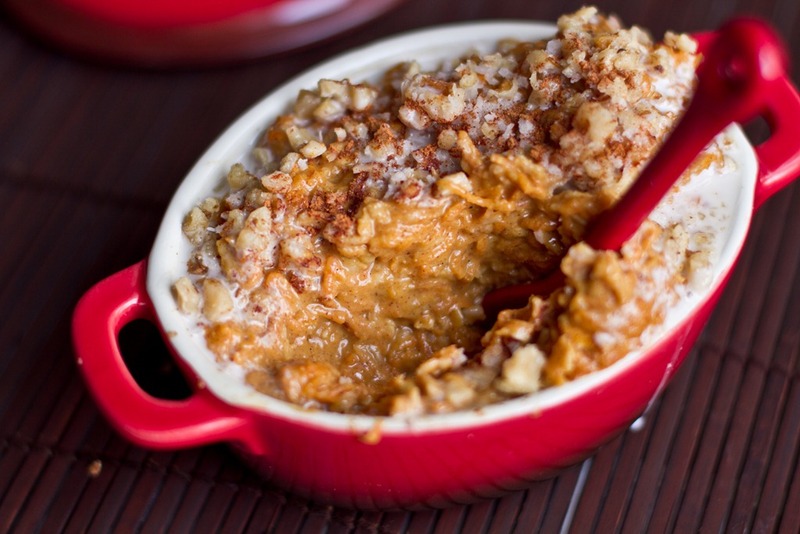 If you enjoy carrot cake, you will go absolutely crazy for this bowl of oatmeal. I could totally see this as a fun, quick, and easy holiday breakfast for families who are looking for something that tastes indulgent, but is packed with nutrients and a full cup of carrots per bowl. I believe i t would turn any oatmeal hater into a fanatic with first bite. This one is for all of the carrot cake fans! Creamy, crunchy, chewy, and sweet, this recipe packs in a full cup of carrots and a handful of healthy ingredients. This oatmeal is also wonderful as part of a holiday breakfast with loved ones (the serving size can be scaled up). I love serving it with Coconut Whipped Cream to take it over the top! This recipe is an updated version from my 2010 version. In a medium-sized pot over medium heat, whisk together the almond milk, maple syrup, cinnamon, ginger, nutmeg, and a pinch of salt until smooth. Stir in all of the grated carrots and oats. Bring to a low boil and then reduce the heat to medium to simmer. Cook, uncovered, for about 8 to 11 minutes, stirring frequently until thickened. Sometimes I stir in another tablespoon of almond milk if it's too thick. 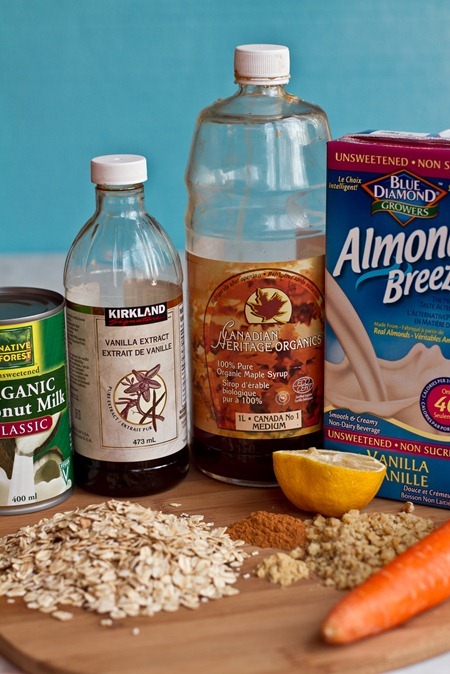 * In lieu of almond milk, coconut milk is a fun alternative! This one is for all of the carrot cake fans out there! Creamy, crunchy, chewy, and sweet, this recipe packs in a full cup of carrots and a handful of healthy ingredients that will keep you feeling full for hours and hours. This oatmeal is also wonderful as part of a holiday breakfast with loved ones. If you are adapting this recipe for several people, I suggest pouring the oats into a large casserole dish when they are ready, adding your toppings, and using a large spoon to scoop portions onto plates or bowls. Directions: Finely grate 1 heaping cup of grated carrots. 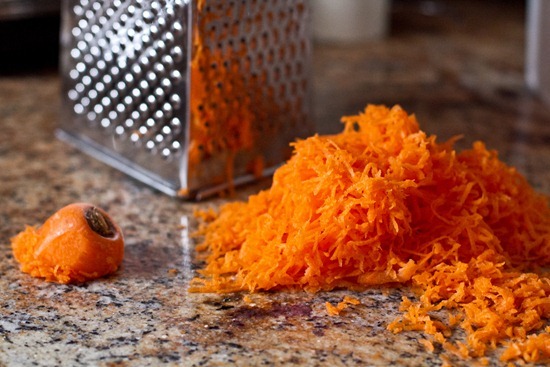 You want to use the fine grate and not the large one so the carrot shreds are very small. This helps the carrot blend in more. In a medium sized pot over medium heat, whisk together the almond milk, optional coconut milk cream, cinnamon, nutmeg, ginger, and a pinch of salt. 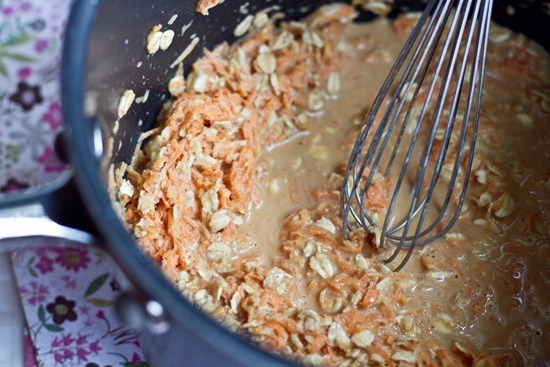 Stir in the grated carrots and oats. Adjust heat if necessary or bring heat to low if it starts to boil. Cook for about 8-9 minutes, stirring frequently. When the mixture has thickened up, remove from heat and stir in the vanilla extract, 1 tbsp walnuts, 1 tbsp raisins, and 2 tbsp of maple syrup. Remove from heat and portion into bowls. Top the oatmeal with the remaining walnuts, raisins, and shredded coconut. If you are using coconut cream, you can mix a bit of the cream with maple syrup and drizzle on top of the oatmeal, as shown in the photo. Sprinkle with cinnamon for garnish. I urge you to make this recipe exactly as I wrote it above…it was that good!!! Who knew you could eat a heaping cup’s worth of carrot in a bowl of oats and it would taste amazing? I picked up this cute mini casserole from Benix the other day and it makes the perfect oatmeal vessel! The best part about the mini casserole dish is that you can pop the lid on and refrigerate any leftovers that you have. I had some leftover and I just ate it as a snack later on in the day, straight from the fridge! 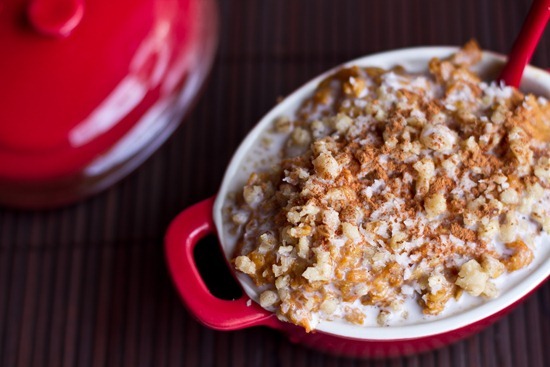 Garnish with 1 tbsp of crushed walnuts and 1 tsp of shredded coconut. Sweetened coconut, if you are feeling downright crazy. Now pour on the 1 tbsp of coconut milk cream + maple syrup mixture and drizzle your heart out! This mixture tastes incredible. Silky, creamy, and sweet. It is the perfect topping for the carrot cake oats! I was feeling crazy, so I ventured outdoors for some pictures! The great thing about oatmeal is that you can take it outside in the cold for a photoshoot, come back indoors, and it is still hot! bahaha. My mini casserole dish got me thinking how great this recipe would be adapted for several servings and poured into a large casserole dish. You could easily double, triple, quadruple (etc) the recipe to serve the amount of people that you need to. 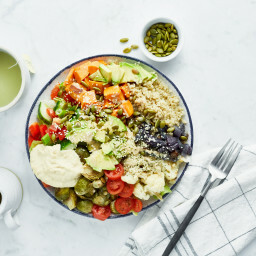 Then simply, pour the cooked oats into a large casserole dish, add your toppings, and use a large spoon to serve so others can scoop out their desired portion onto their plate. I think it would be a wonderful holiday breakfast! If you are looking for a delicious, healthy, and super quick holiday breakfast, you should give this one a shot. Mmm!!! That looks (and sounds) AMAZING!!!!!!!!!!! Yum that sounds unbelievable!! I have oatmeal almost every day for breakfast – I might have to try this combo soon! And I have to say…a full LITER of maple syrup?? I think I just died… o.O Yum! I know! I can only find itty bitty bottles of maple syrup! I’ve just been hooked on eating my Nature’s Path apple cinnamon instant oatmeal because its easiest at work. maybe next week when i’m off work i’ll make some more exciting oatmeal for my breakfast life! This looks very delicious, but I love any hot oatmeal. By the way, you remind me a lot of the Norwegian actress Maria Bonnevie. Have a google look :). I never eat Carrot Cake because of the ridiculous calories, fat, etc..but I love it so much! This is like an early Christmas present! I cannot wait to try it out!! that looks so good! I wish I could smell it through my lap top. Mmm im STILL addicted to your hot comforting pumpkin pie oatmeal, obsession has set in. haha I have not had pumpkin since my pumpkin detox a while back! I completely made myself sick of it for the rest of the season. I dont even desire it anymore! Such a shame..lol. I blame the PFB pumpkin challenge b/c I tested out a ton of pumpkin recipes until I was blue in the face. Dont hate me. I shall love you again next season. What about your workouts? Do u still run outside? you’ve got to be kidding with this…i would DIE OF HAPPINESS…really though! 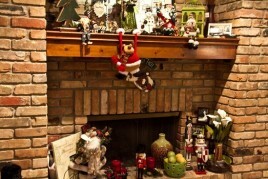 i can’t wait to make this for my hubby’s family in a couple days! I used to make this all the time a few years ago. Try it with pineapple chunks and/or raisins too. Deicious! Love the sound of that recipe. Haven’t had cake carrot porridge in ages! This sounds absolutely heavenly and impossible to resist. I need to shake up my morning oats routine. That looks really good! I’ve had a bit of a craving for carrots recently. Just a random thing that comes and goes every once in a while. that looks so fabulous! i have been eating oatmeal almost every day this week since it has been so damn cold and this looks like a delicious way to step outside my usual oatmeal box! That looks ssooo good! but it looks freezing outsie you’re braver than me I would never go out there haha. Your so good at presenting food. I wish I had more bowls and scenery and stuff. ANyways I have had a form of carrot cake oatmeal on my blog but not quite that good sounding nor looking. 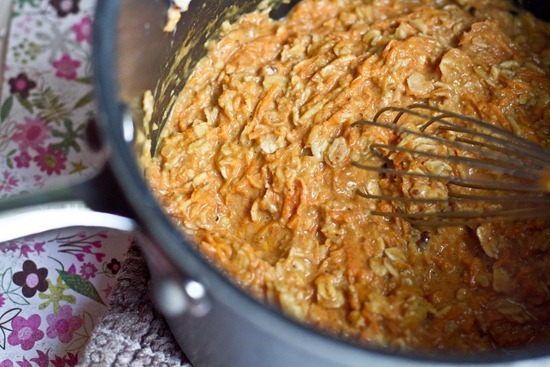 I adore carrot cake oatmeal. YUMM!! I just had oatmeal for breakfast, but I still feel like I NEED THAT CARROT CAKE OATMEALL! that looks incredible! carrot cake is yum, i bet this is amazing. Mmmmmm…… I am definitely going to try this! I used to not like oatmeal either – I found the texture off-putting. That’s why I LOVE steel cut oats! Angela, if you have never tried making steel cut oats I heartily recommend you try it sometime in these cold winter months – you’ll thank me later! They do take a while to cook (low and slow) but it’s worth it. I’ve heard of people using a crockpot or other overnight methods to speed up the process in the morning but never tried it myself. If you try steel cut oats, let me know what you think – better yet, blog about it :) I hope you like ’em! That looks fantastic! I’ll have to pick up a few ingredients that I’m missing and make this soon! I never even thought about putting carrots in my oatmeal. You are always coming up with creative breaky ideas! Thanks! mmm looks delish! 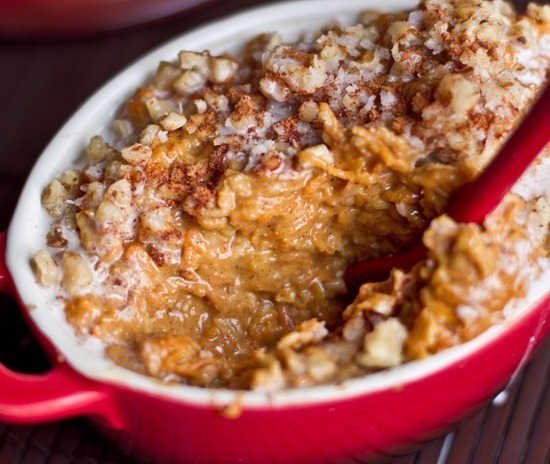 What a fun way to switch up oatmeal. I love oatmeal for breakfast but it can get kinda boring after a while. I’ll have to try your recipe soon! You are so right, if this doesnt turn someone into an oatmeal lover, nothing will! I love carrot cake…ginger, cinnamon, nutmeg, raisins, all those flavors…I heart them all. And I know I would love this spin on oatmeal! Yum! you are sweet! I cant wait to see how you like your dslr…there is a big learning curve at the beginning so don’t get discouraged. That looks amazing! :) Do you soak your oats before eating them? I’ve been reading a lot about the phytic acid content in oats and grains, and how if they aren’t soaked, it can inhibit the absorbtion of many nutrients, and leave you deficient. I guess if you only eat oatmeal once in awhile, it’s not a big deal…. but if you eat them everyday, it could be. Thoughts? I havent heard about this…but I do not soak my oats before cooking. There is phytic acid in oats, as in many other foods. Soaking/sprouting is a great way to reduce the phytic acid content of your grains. But even if phytic acid can interfere with the absorbtion of certain nutrients, espeially minerals, I doubt that eating unsoaked oatmeal will leave you mineral deficient if you have an otherwise healthy diet. And Angela’s carrot cake oatmeal sounds too delicious not to try it! (but if you like, you can soak your oats at least one hour before eating them. You can let them soak overnight in the fridge, drain, and yhe oats will be soft enough to skip the cooking part). 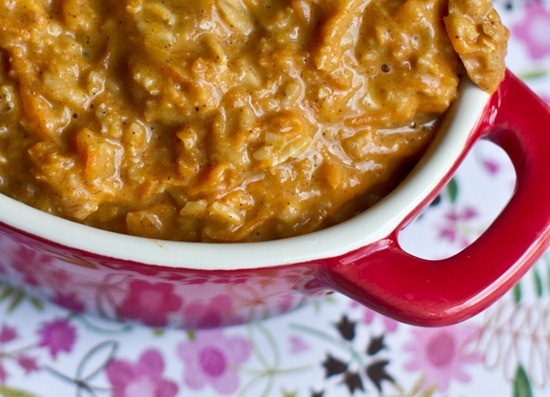 I’ve GOT to try this because, so far, the only way I can enjoy oats is your savory recipe. So I totally trust you to guide me to a sweet recipe, which I’ve wanted to give another shot for a while! I must make this! I’ve never used coconut “cream,” but definitely worth trying. Thank you! Simply amazing! I love carrot cake, but it’s not so good for my weight loss efforts, this will help with the cravings!! Oatmeal makes my heart sore. Honest. I’m intrigued by the carrot cake verison you showcase..and yes I’d like a bite! Not only do I want to try these delicious looking oats immediately, but the pictures REALLY top it off!! Especially the picture of the little bowl in the snow…LOVE it! This would be amazing as a Christmas morning breakfast! It’s too bad the rest of my family doesn’t like oatmeal. :P I’ll definitely be trying this for myself though! My fam aren’t big oatmeal people either, but i may try to offer it anyways! Carrot cake is my favorite… finally a version you can feel good about eating for breakfast! 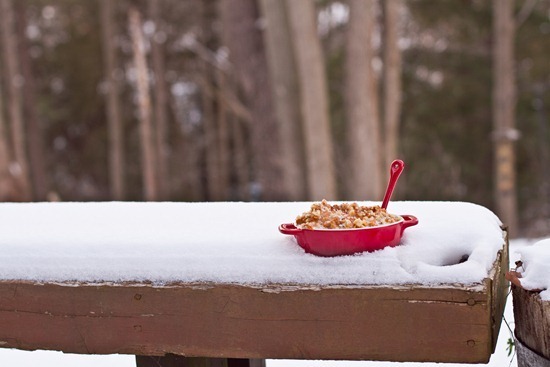 I have been debating taking my oats outside to our snow for days! But every time I imagine the oats getting too cold and change my mind. Mine would definitely get cold! fabulous idea!!! i love your outside shots! The oatmeal and delightful casserole dish look divine!!! Yum…I love carrot cake…recently I’ve been obsessed with baked oatmeals like on HTP…I’m going to try a carrot cake version of that and report back! 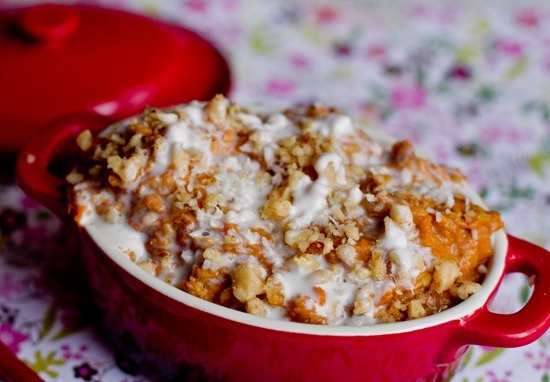 I am a huge carrot cake fan…this looks like the ultimate breakfast. I love this recipe! Will have to try it ASAP! So I am on maternity leave and having a glum day so I decided to make this for an early dinner for myself and IT IS DELICIOUS!!! I didn’t have coconut cream so I subbed in regular cream (thereby de-vegan-izing it…d’oh!) and used crushed almonds instead of walnuts and I am in heaven. I just really needed to tell you this. I don’t know if you’ve ever thought about writing a cookbook, but if you do…include this one! I think I’ll just have to join you and Eric for breakfast from now on! This looks AWESOME! What do you do with the rest of the coconut milk? Oh my gosh, that looks incredible! I wish I had the ingredients on hand right now! What a fun way to start off the day with some vitamin A! I want this– now, for dinner! What a fabulous way to sneak an extra vegetable into your day. Yummy! Thank you for another brilliant hidden veggie breakfast inspiration! Those a.m. vegetables always make me feel great throughout the day. And the tiny casserole dish is too cute! yay for breakfast posts! I love when you post your breakfast! Where did you get that spoon from? I am on the hunt for a plastic spoon JUST like that and I can’t find one anywhere! i’ve been so sick of carrots lately. i think this will pull me out of my rut. i was sick of carrots for a while too! Oh my gosh this looks delicious! I’ve been trying to figure out interesting ways to eat oats because having the same breakfast every day can get boring. AND I’m trying to get my family members to start having porridge for breakfast… so this looks perfect!! I’ve heard that cooked carrots aren’t as nutritious because they turn to sugar (?) but what the heck, this looks so yummy that I *have* to give it a try! How do you think this would be as a dessert? It seems like it would be similar to a rice pudding, which makes perfect sense for dessert … but oatmeal might say “breakfast” too loudly for dessert eaters? dessert…hmmm not sure it would cut it? Made this today! DELICIOUS! I made a few substitutions (Pumpkin Spice Silk Soymilk instead of Coconut Milk, GF rolled oats, big glob of home made PB on top). Delicious Angela, thanks for the recipe! PS My Husband just woke up and asked if I was in the middle of baking something, this recipe is a WINNER! In a word, YUM! This looks delicious. As always, LOVE your photos, and seriously love the little red bowl with the lid!!! Got up early today and made this for my hubby before work… we both loooooved it! What a treat, thanks for the recipe! :) My friend just told me about your blog, and I think I’m going to be a frequent visitor! Okay so I don’t have Almond or Coconut Milk. Can this still be made with regular milk? I am hoping that I can try this oatmeal this week! Yes, yes I do want a bite ;) Looks delicious, as usual! PS: I used to read your blog when I was doing one over the summer and now am starting again; glad to be reading again! Nom nom nom! Looks delicious, and I am so NOT a carrot person! The casserole dish is adorable too. I want one! have you ever tried making carrot cake pancakes?? Hi Angela! That looks amazing! I’m always looking for a new oatmeal recipe to try. I’ve been reading your blog for quite a while, but this is my first time commenting. 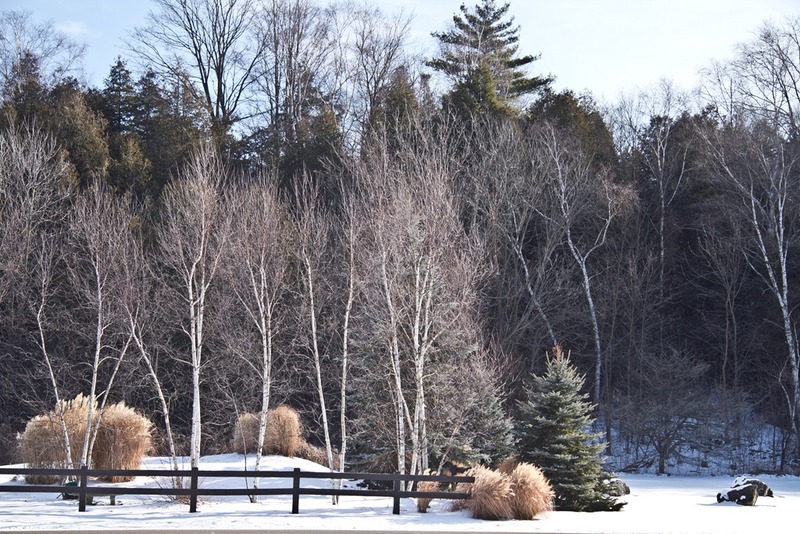 Your blog is so much fun to read, inspiring, and absolutely beautiful! I just started my own blog and would love to know your opinion on it. If you get a chance, please check it out! I’ve been reading your blog for a while, but this is my first time commenting. Your blog is super fun to read, inspiring, and absolutely beautiful! I just started my own blog and would love to know your opinion on it. If you get a chance, please check it out! Swoon. I want to eat these immediately. I look forward to hearing your perfected overnight oats method! Yum! Made this for breakfast this morning and it was AMAZING! 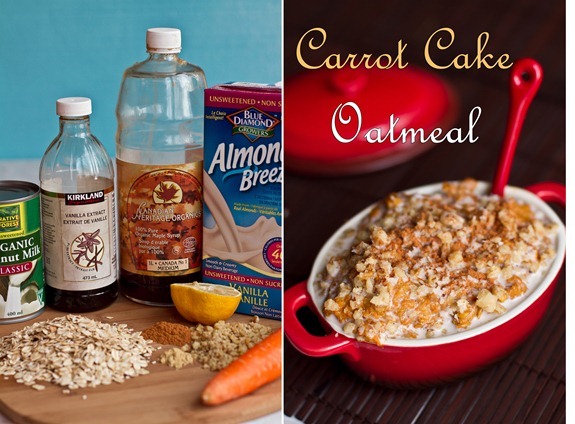 I love carrot cake, and I love oatmeal… why have I never thought of this before?!! I love getting a serving of veggies for breakfast. It’s the one meal that is too often veg-free. I love this idea!!!! Merry Christmas! That looks really good!! I made your pb and j banana pizza a couple days ago and it was really good! I used whole wheat pastry flour instead and it worked out! I’ve had it for breakfast the past couple days and for a snack. MY family liked it too! I am making some overnight oats tonight, going to look at some of your recipes to get an idea. My dad always called oatmeal,” A love tap for your tummy.” I cannot wait to make this for him. I am trying to make your pecan streusel butternut blondies but I am wondering what I may substitute for the 1/4 cup of butternut squash. They are fairly expensive here and I don’t have a food processor to puree. Could I add 1/4 cup more butter or would that be too much? I also plan to make the peppermint walnut crunch blondies. Both will be served as my dessert on Christmas day. Thank you for the great recipes! I can’t wait to try them and for everyone else to try them. I LOVE this :) I consider myself warned hehe. This sounds very very yummy :) Might have to try it in the morning! I am eating this right now! I read this post last night and just knew I had to have it this morning. I made some modifications based on what I had in my kitchen and still came out fantastic! Love having new ways to eat oatmeal! that’s funny that you dreamed about them! I made this, this morning as a trial run. OH MY GOSH! My 4yr old and mother both absolutely loved it! So I am sure it will be as big of a hit for Christmas breakfast in the morning! Thank You for all that you do & Merry Christmas to you! yay!!! That’s awesome :) Merry Christmas! That sounds like heaven in a bowl. This looks so good. Would it still work without the coconut milk cream? i just made this for my new year’s day breakfast. 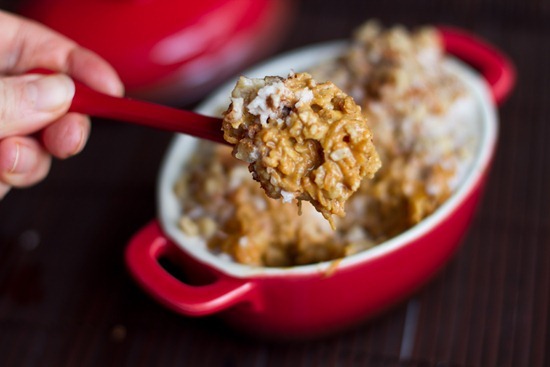 i never would have called oatmeal “decadent” until i tried this recipe, but it really is! sooo delicious. thanks for the recipe, and happy new year! Hi! I found your website while browsing for healthy recipes online! Saw this recipe on your site and had to make it right away! I’m not a plain oatmeal lover so this was just the ticket! I LOVED it! AMAZING! Thanks so much! I just made this for breakfast, and it was absolutely AMAZING!!! It was so quick and easy to prepare. I only regret not eating it slower! Thank you!!! This is the THIRD weekend in a row where I made this heavenly oatmeal. I’m usually so lazy to comment (although I conscientiously follow your blog), but I had to say Thank You Angela :) With love from Taipei – Taiwan. OH.MY.GOD. I just HAVE TO try this!!!! It sounds SO delicious!! I just tried this recipe – it was wonderful! I didn’t have walnuts so I used almonds instead. Thanks for the recipe! 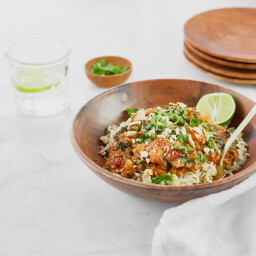 Question – if I were to try this with steel cut oats, how might I adapt it? I know I’d have to cook it longer, but how much longer? I just made this and it is seriously the BEST oatmeal I have ever tasted!! I will definitely be making it more often! I just made this for my family, and everyone LOVED it! So scrumptious and tastes like dessert. Thanks for the wonderful recipe! for the ground ginger can i just use finely grated regular ginger? Made this this morning and it was absolutely delicious! I love all of your hot oatmeal recipes, they are a great switch up from the basic oatmeal base with toppings. Have a great day! I made this today and it was amazing! I used about 5x the cinnamon that it called for and I left out the raisins and walnuts (I didn’t have walnuts and I hate raisins) and I LOVED IT! I will be making this again in the near future. Thank you for the recipe. can i use regular milk instead of almond?? Yes, you can use any kind of milk you’d prefer. I am eating this as I type as lunch. Because I discovered your recipe somewhere between breakfast (strawberries with oatmilk and musli) and a rumbling tummy asking for lunch. So i thought, heck why not? I’ve got carrots from a farmers market and yummy oat milk in the fridge, might as well give this a shot. 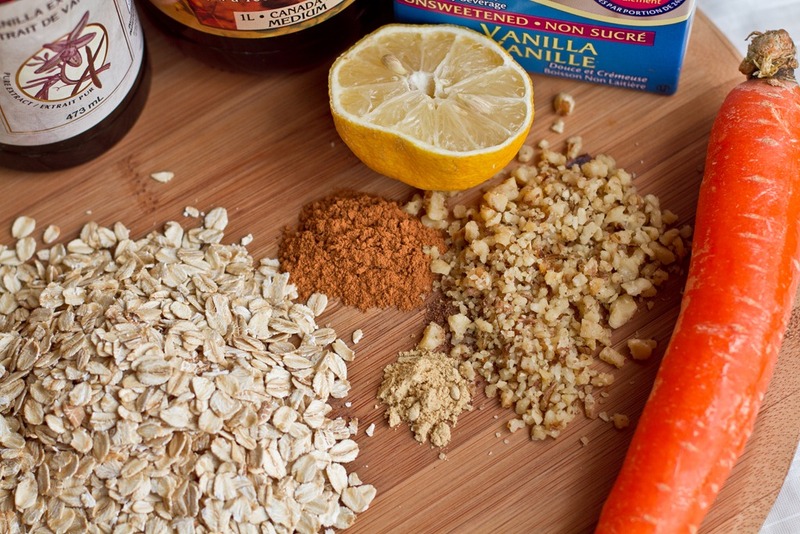 Interesting… I often throw some shredded carrot from the juicer into my children’s oatmeal along with a lot of the ingredients you listed. Good, healthy way to save the pulp! They love it! I just finished my bowl after making this for the 1st time it was simply delicious! Hubby & I are on a 30 day vegan challenge this is day 6 but with recipes like this we can easily turn into lifetime vegans! Thanks for your creativity! I’m so happy to hear that – congrats on your challenge! Let me know how it goes. Just made this recipe this morning – fanastic!!! Truly tasted like carrot cake. I used soy milk and did decrease the maple syrup to 1TB – and still sweet enough for me. Just made this. What a great recipe! I didn’t have any almond milk so I used low-fat cow’s milk instead. Didn’t use coconut milk cream or coconut. Also, I only had about 1 T of raisins and 1 T walnuts left in my pantry, and used just 1 T of maple syrup to cut back on sugar. Will definitely add the full 2 T of walnuts next time. So delicious! I just made this, it is so good! The taste is totally unexpected and delicious. I couldn’t shred my carrots as finely because I don’t have the tools, so I just gave them a chop after the shredder. Mine seems chunkier than yours, but so delicious. I took a pic if you want to see I’ll send it to you! We’ll definitely be featuring more of your recipes on our site. I love what you’re doing here. I love everything from your blog that I have tried and this was no exception. Who would have thought carrots for breakfast could be so right? Mine turned out exactly like the picture- even though I didn’t use coconut cream, I used coconut-almond milk, which is the nectar of the gods as far as I’m concerned. I don’t know why I haven’t ever thought about using maple syrup to sweeten my oatmeal instead of brown sugar like I normally use- maple syrup from now on! I’m not vegan, but I used to be and I still eat a lot of/love vegan food. Thanks for showing the world how delicious healthy food is. Just found you recipe and it’s amazing. I’m not sure if anyone mentioned this, but a dollop of yogurt on top really adds a lot if you don’t have coconut milk. Squealingly delicious! 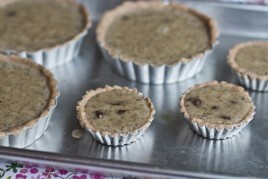 Thank you for sharing the recipe…I’m featuring it today on my blog! Cheers! 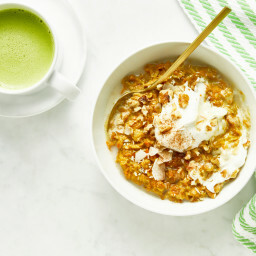 Your recipe/s and pictures are so good that you’ve successfully turned the oatmeal lover in me into a fanatic, you’re so right! This is a genius recipe! I adapted this to what I had on hand and sort of layered it in the bowl I baked it in. I am not a vegan so, would have added butter, but I was out, so I drizzled tahini on the top. My husband and I both loved it! Thank you for new inspiration! I also happened to see your post from way back on Eric’s birthday. Nice to see that sweet Canandian heart-centeredness. You are wonderful. This was really great! I made some changes with what I had on-hand, but only changed the way I put the recipe together – the ingredients all stayed the same. 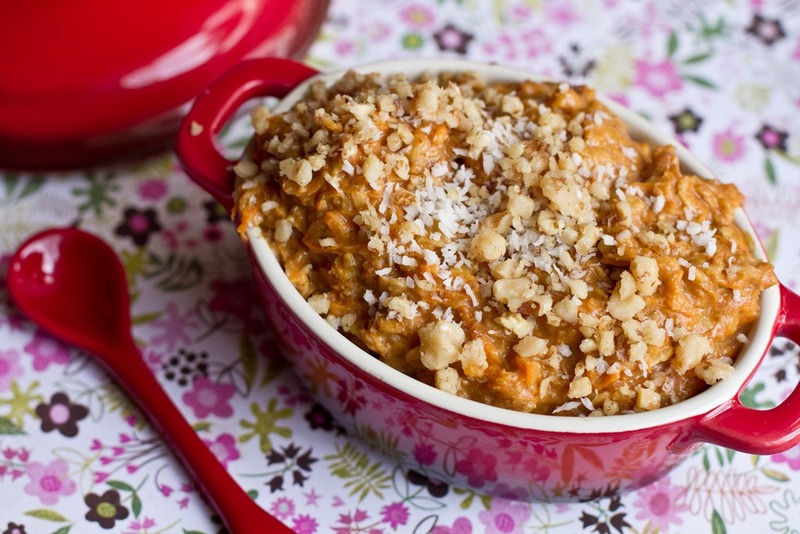 The grated carrot just melts away into a beautiful bowl of bright orange delisciousness! Oh, and I put the raisins in while the oatmeal was cooking – I love the juicy fullness of a “re-hydrated” raisin. this may be a silly question, but i saw that you wrote lemon juice in the ingredients, so i prepped it, but then when i was done cooking, i realized it was still just sitting on the counter. when should i add it in? thanks! That looks like one comforting bowlful of hot hot oatmeal with all the ingredients of the fall season!!!! for me nutmeg and carrots are all about fall…dont knw why? ?/ Great pics as always Angela. Loved the one with the teal background!. Ah! Stop, you’re too cute! 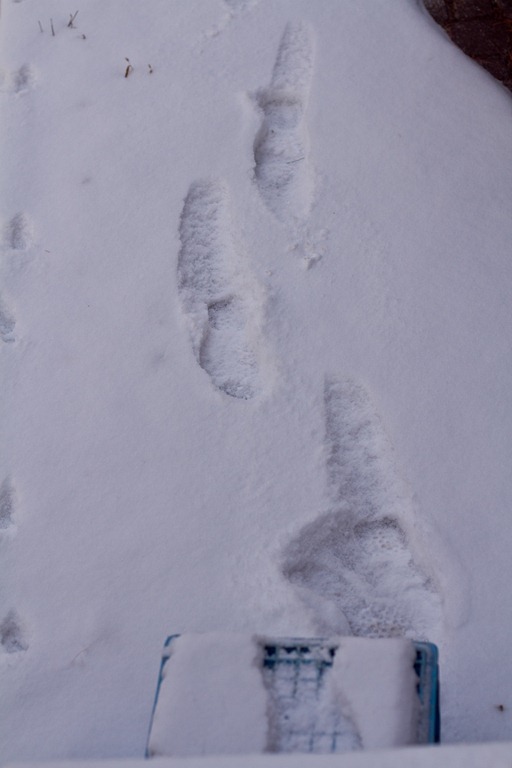 This is my next adventure of yours… I am dreaming now – and at work, so I had better go! Thanks for your life’s work! Omg I can’t even look at that without drooling. I MUST get the ingredients for this and make as soon as the weather starts cooling off. As of now, it is way to hot to eat a cooked breakfast. I’ve been doing smoothies and cold soaked oats all summer because just the thought of having the stove on makes me sweat. But I cannot WAIT to try this. It looks so amazingly decadent. This is fantastic! I am making everyday a holiday! Made this for my boys this morning without any explanation. “Mama, this tastes like carrot cake!” And then they launched into a lengthy conversation about how great it would be if our house was flooded with carrot cake oatmeal and you could eat it whenever you wanted. So, yeah, a hit. Thank you! hahaha love that idea! Oh kid’s imaginations are just the best. Glad it was such a hit! Do you think I could make this in the slow cooker? I made this and it was pretty tasty. I ate the whole thing though. There was no way i was only eating half. worth trying , surely will put this to work . will also try on baking this . thank you ! I love this book. The recipes are great, but one thing is missing. The nutritional values at the end of the recipes would have been helpful. As a person who needs to count carbohydrates, protein and sugars the values would have made calculating so much easier. However, I do love the recipes and have made quite afew. The photos are always an assest to a cookbook and these ones are beautiful. Angela, would you be interested in donating one or two of your cookbooks for our online auction? Adam’s Dream Fund is in its 17th year of fundraising for the Sick Kids Hospital, have already raised over $1.7MM toward two programs: Paediatric Oncology and the Clown Therapy Program. We would love to have your book in our auction. 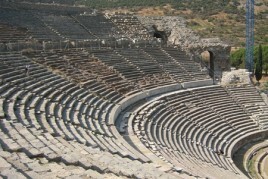 It takes place May 23-May 27. Please let me know. Hi Deborah, Please email Erin Kelly from Penguin at: [email protected] – thanks! Hello Angela, I’ve recently discovered your blog and made this yesterday…it was amazing, and will definitely be making regular appearances on our breakfast table! This was AMAZING!!! I had this for breakfast today and will definitely be making it again! Could you make this the night before and eat it for breakfast the next day? Thanks for this recipe. I found it this morning and tried it out on my little people. My eleven month old son had two servings (I left the maple syrup out of his). I love that I can get oats and vegetables into the children at breakfast time! I shouldn’t have deviated from your recipe – I used fresh grated ginger because I have heaps of it at the moment, and it made it a bit too spicy (I will stick with powdered next time). I’m going to go and try making an adapted version of my favourite breakfast oat muffins and turn them into oat and carrot muffins. Thanks again for the post, glad I found your website. Can you use shredded sweet potato instead of carrots for the oatmeal? I thought you might like to know that this recipe, almost word for word, just won the grand prize of $5000.00 from Bob’s Red Mill Natural Foods recipe contest and that they plan to take it to Scotland to compete. Hi Mary, Thanks for the headsup. I was emailed about this 3x today…eek. I guess I better look into it! 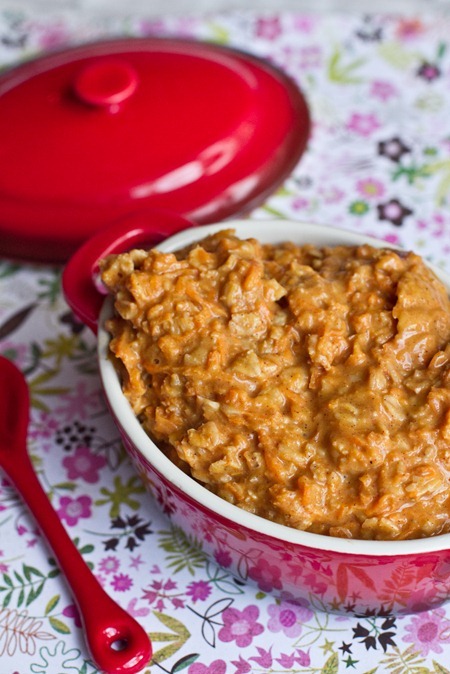 My toddler and I loved this, a great way to get her to eat carrots, thanks for the recipe! How would you go about adjusting this if you were to use quick oats? Looks wonderful. What’s the nutritional info on this, I didn’t see it? I have a diabetic in the family. Had some leftover carrots and decided to make this recipe. Never would’ve imagined using carrots in my oatmeal but it turned out very tasty! Hi! Can this be made the night before? can i replace regular oats with instant oats? hi Angela, can i replace the regular oats with instant oats? thanks! How far in advance can I make this? If I make it 2 days before and leave it in the fridge, can it be reheated before serving? When do I put the lemon juice in? Hi Jess, I’d add it in when you add in the vanilla extract, walnuts, raisins, and maple syrup. This looks amazing! I’m in love with your overnight oatmeal power bowl from Oh She Glows Everyday right now. It’s super filling and really quick in the morning. Could I “sprout” the oats and carrots overnight for this recipe for a quick breakfast as well? Hey Carolyn, Oh love your recipes tweaks! I’ll have to try it with some protein powder next time. Make this for my 2.5 year old and we loved it! Does it freeze well if I make a big batch? This is excellent! I’m out of vanilla so it’s the only ingredient I didn’t include but it’s still perfect! Hey Larke, So happy you tried this out and loved it! It’s one of my all-time favourite oatmeal recipes. Hi! 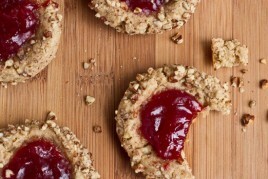 I’d love to share this recipe with my Heart of Winter CSA members. Is that ok? Hi Andrea, Thank you! Please send your inquiry to press[at]ohsheglows.com and we will help out. I’ve been on an overnight oats kick and decided to make this “hot” oatmeal into a refrigerated version instead. I followed the recipe exactly as written but instead of cooking the oatmeal on the stovetop, I instead put everything in a bowl and set it in the fridge overnight. As suggested I used the small side of my box grater for grating the carrots which I think did give it a better texture than using the standard holes. This way, the carrots didn’t need cooking either and tasted fine the next morning without being heated. I’d have two suggestions for anyone else wanting to make this recipe into overnights oats in the future: 1.) cut the amount of liquid down to 1 cup & 2.) I felt this recipe really served 1 person as opposed to the 2 servings suggested. It may have been a bit much for one person, but I feel like 2 people would have gone hungry otherwise. Maybe a good sub would be 1/3 cup oatmeal and 2/3 cup milk per person? Hey Ceilidh, Thank you so much for your feedback! I love that you turned it into overnight oats.